South Laurel Views: There The WSSC Goes Again, AGAIN !!! holiday weekend and one week since the excavation was last patched. Predictably, high volume traffic has again turned it into a big pothole (deeper and more jarring than it looks in this photo) that has already thrown at least one hubcap. I called the WSSC maintenance line this morning and asked them to send out a crew to fill the excavation again -- and to refill it once a week, every week, before each weekend until a permanent repair can be made, so as to reduce the risk of more damage to vehicles, personal injury or even death, as even drivers who see the hole risk either being rear-ended as they slow down or head-on collision as they swerve left out of that only west-bound lane across the yellow line into traffic coming at them in the east-bound lane. At 9:30 AM the WSSC filled the excavation temporarily with uncompressed asphalt. The hole was converted into a bump that cars are now avoiding (when they see it) by swerving to the left into oncoming east-bound traffic. 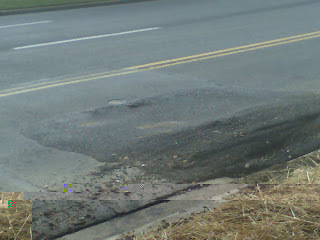 It is unclear if this patch will last over the weekend, or revert again to a hole, as more cars and trucks hit it. (Feb 7, 2008) For the 3d time in 13 months, the Washington Suburban Sanitary Commission (WSSC) has again (again) abandoned work in progress on the perpetually problematic fire hydrant near Montpelier Mansion just as one turns onto West-bound Muirkirk Rd from Rt. 197, leaving a dangerous excavation -- this time 3 feet by 3 feet by 8 inches deep (and getting deeper with each passing car) -- without cover plates or warning signs or any other traffic safety measures. And just like those two times before, today's tank trap -- noted at 4:30 pm -- is ALSO in the only west bound lane. So, drivers who are fortunate enough to see it must either slow abruptly -- risking rear collision from cars behind them -- or no less dangerously, they must swerve left into the East-bound land risking head-on collision with opposing traffic. The damage to cars, and danger to drivers and passengers will only get worse as night falls and the tank trap becomes invisible until it is too late. Some cars hit the trap, some swerve into the opposing traffic lane and some do both. I called PG Non-Emergency Public Safety 301-352-1200. Two PG Police vehicle patrol officers responded promptly to evaluate the situation, but it was not clear at that time what WSSC would do. I drove by again at 7:45 pm and saw that nothing had yet been done to reduce the danger. By that time i was able to call WSSC emergency directly, who took my report about the situation, including my concerns about the risks of personal injury and property damage, and my explicit request that WSSC send someone out immediately to assess the situation and make it as safe as possible overnight.